The resources below have been developed to support you and assist you to talk to and to educate your children about personal safety. This includes finding age appropriate words to talk about personal safety; some guided discussion suggestions that approach issues in a non-confrontational manner; information about indicators of child sexual assault; and how to respond to difficult behaviours. Are you looking for more in-depth information about child sexual assault? Please take a look at the Research section of website, where you can download copies of Bravehearts’ research papers, positions statements and more. If you are seeking an in-depth look at the facts and statistics around child sexual assault, you may wish to read our research paper,Child Sexual Assault: Facts and Stats, which is updated by our research team every six months. Below are some resources you may wish to purchase to help you teach your child about personal safety. These resources are based on our personal safety program, Ditto’s Keep Safe Adventure Show, and are suitable for young children aged 3 to 8 years of age. This parent/carer pack contains resources to assist parents on educating their children (aged 0-4 years) on personal safety. > Ditto Keep Safe Adventure Music CD (0-4 years). This parent/carer pack contains resources to assist parents on educating their children (5-8 years) on personal safety. > Ditto Keep Safe Adventure Music CD (5-8 years). Ditto's Keep Safe Adventure Show DVD is designed to educate and empower young children (aged 3-8 years) with personal safety guidance and presents the skills and knowledge on how to keep safe using child-friendly language in an engaging and interactive style. 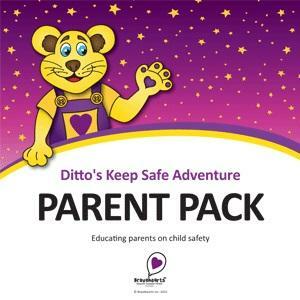 This CD contains Ditto’s Keep Safe Adventure songs that help young children to remember Ditto’s personal safety messages from key criteria in the program. Songs included are Yes and No Feelings, Warning Signs, Private Parts, Secrets and Run and Tell Someone You Can Trust. The CD brochure contains lyrics and Ditto’s Three Rules for your reference. A support leaflet is also included to assist with guided discussion related to each song. This CD is accompanied by a support guide to assist parents, teachers and young children with the content of the songs. These CD's contains Ditto’s Keep Safe Adventure songs that help young children to remember Ditto’s personal safety messages from key criteria in the program. Songs included are Yes and No Feelings, Warning Signs, Private Parts, Secrets and Run and Tell Someone You Can Trust. The CD brochure contains lyrics and Ditto’s Three Rules for your reference. A support leaflet is also included to assist with guided discussion related to each song. Personal safety storybooks 'Becky and the Doctor' and 'Ben and the Babysitter' can be used to begin to explain the meaning of privacy, private parts and keeping safe with young children.